This book is #6 on the most-read list, my 2nd book. Now the truth is, as a writer, Avon talked his craft very well, with wonderful wit. Indeed, he was a wonderful storyteller, with many a good tale to tell. That said he was a very, very, very slow writer. That was the origin of a book originally titled Snail Tale. It features a hyper-active ant named Edward and a snail by the name of Avon, who does things very, very, very slowly. It concerns their mock-epic adventures along one branch. The book was published very modestly. Years later, another editor (from a different publishing house) read it, liked it, and wanted to republish it. She did suggest more revisions. Done. 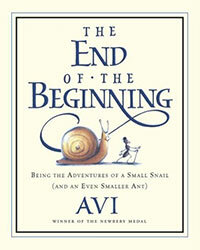 It was reissued with vastly superior illustration (by Tricia Tusa) and a new title: The End of the Beginning. The best answer to this is to suggest the real inspiration for the book is very much Alice in Wonderland and Through the Looking Glass. Which is to say Lewis Carroll was both a brilliant thinker and capable of being exceedingly witty. I lay no claim to being brilliant, but I hope I’ve been funny.